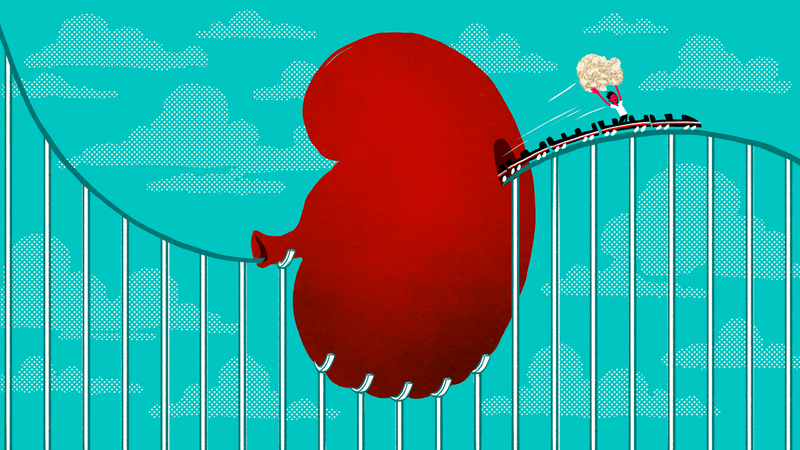 A team of researchers rode a roller coaster more times than they probably care to remember, just to figure out why roller coasters trigger the passage of small kidney stones. With the further help of a 3D-printed model of a kidney filled with urine, they think they’ve solved the puzzle. In the new study, published in the Journal of the American Osteopathic Association, urologist David D. Wartinger and his colleagues at Michigan State University College present evidence to support widespread claims that riding a moderate-intensity roller coaster can help people pass small kidney stones. The results, though still preliminary, could assist in the development of a rather unconventional therapy for patients. Kidney stones are a mass of chemicals and salts found in urine. Passing kidney stones can be an excruciating experience, particularly when the stones are large. Getting them out early before they get too large is key to reducing much of the discomfort and risk. Pregnant women often pass kidney stones, the result of increased vitamin intake. Physical labor will sometimes loosen it, as will bungee jumping, bouncing on a trampoline, dirt bike riding, and even a violent sneeze. The fact is, scientists haven’t been able to isolate a single trigger—but roller coasters seem to play an important, and even reproducible, role. Wartinger and study co-author Marc Mitchell used 3D printing to create a clear silicone anatomical model of this particular male patient’s kidney. They filled the model with the patient’s urine, and placed three kidney stones of various sizes in the upper, middle, and lower passageways of the simulated kidney. After sealing the model, the researchers set off for Disney World. At least for this patient’s simulated kidney, the data showed that sitting in the back of Big Thunder Mountain Railroad resulted in a stone passage rate of nearly 64 percent. Front seat rides produced a passage rate of nearly 17 percent. The researchers say that powerful and random forces jarred the stone lose, guiding it through the passageway. Wartinger believes this can be replicated, but not everyone will respond to the same ride. Like a fingerprint, each person has a unique kidney passage pattern, so everyone is going to have their own “ideal” kidney stone-jostling roller coaster ride. And for some, other activities may prove to be more effective. Indeed, many have compared the pain of passing a large stone to natural childbirth. He says it could also help people who have a procedure that smashes a big stone into smaller stones, who can then pass the smaller fragments with the help of a thrill ride. Finally, it can help young women clear small stones before they become pregnant (it’s not advised that pregnant women ride roller coasters). The study is also pertinent to space exploration. The effect of gravity normally helps with the passage of kidney stones, which is why so many astronauts suffer on the International Space Station. “Kidney stones will truly be a challenge for people on Mars 1,” said Wartinger.